GPS systems, MapQuest, Google Maps, and other locally unaware resources will frequently route Yosemite National Park visitors over small mountain dirt roads intended for off-road recreation and logging. These mapping sites do not account for hazardous conditions and very slow driving speeds required to drive these routes. The map sites sometimes underestimate travel times by hours. You do not want to take these roads, you will get lost, especially in winter. The links to maps below have provided to help you plan your trip and avoid this problem. If in doubt, stick to the highways. The Arch Rock Entrance to Yosemite is accessed via the 140 Yosemite All Weather Highway. This route has the lowest elevation route to Yosemite Valley. In winter, you will not need tire chainson this route if you stay in the Yosemite Valley. If you head to higher elevations you will need to carry tire chains. There is currently a detour across the Merced River to bypass theFerguson Rock Slide. The bridges are one way, controlled by a traffic lights (the only ones in Mariposa county). They cycle every 15 minutes. Your vehicle length is limited to 28ft. Crossing the bridges you get a fantastic view of the slide. Read more about the Ferguson Rock Slide. Driving route from Meadow Creek Ranch B&B Inn to Yosemite Valley through the Arch Rock entrance. Take this route if you don’t need supplies from the town of Mariposa and want to see a little bit of the back road beauty of Mariposa. 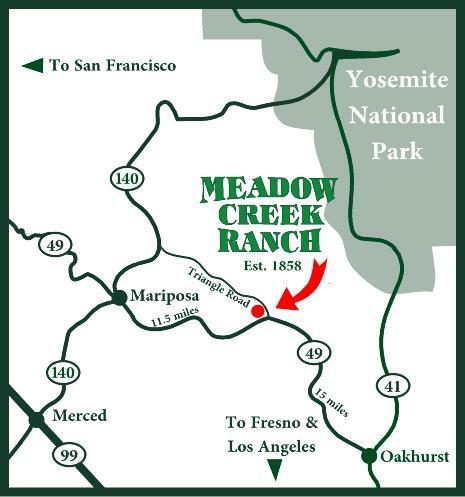 From Meadow Creek Ranch B&B to the town of Mariposa. Take this all highway route if you plan to buy groceries etc. Mariposa is the last town on the way to Yosemite. From the town of Mariposa to Yosemite Valley through the Arch Rock entrance. There are four gas stations on the way, two on Triangle Road, one at Midpines, and a Chevron station in El Portal. Gas is not available in Yosemite Valley, but is available at Crane Flats, Wawona, and Tuolomne Meadows, too far away if you get to the park close to empty. The last station before you reach the park entrance is the Chevron in El Portal where gas can run $1 or more higher than the prices charged elsewhere in Mariposa county. Here is a map to gas stations in the Mariposa and Yosemite area. Oakhurst gas stations are numerous and easy to find. Tioga Pass, the route to Nevada and Mono Lake through Yosemite National Park is closed every year due to snow, it may not open until May and closes when it begins to snow. Do not plan your trip over this pass unless you know the road is open, click here for current conditions. Be aware that Highway 49 from Mariposa to Coulterville is very twisty, with hairpin turns, steep drop-offs, and narrow lanes. It is beautiful, deserted, and is best taken when you have plenty of time to enjoy it. Expect an average speed of 20 mph.